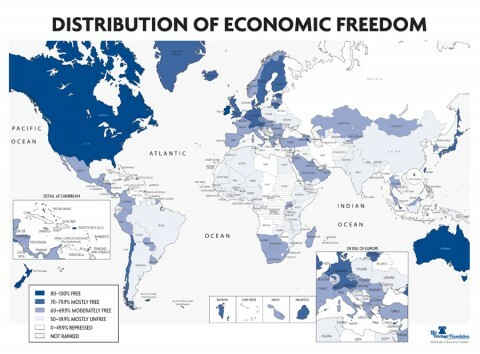 My thanks to history guy for linking to the map of economic freedom. Economic freedom is more important for joining the core of the global economy than political freedom, because political freedom is merely a system of laws while economic freedom teaches affection for private property and fear of arbitrary confiscation. Given that, it’s striking just how destructive Putinism has been to Russia’s chances of living the good life, of joining the core, or of becoming something more than another oil-rich tin-pot dictatorship. Vladimir Putin is overseeing Russia’s breaking of the peace, Russia’s disintegrating soft power, the decimation of the Russian people, and now the dismantling of Russia’s free economy. While I know many who support Vladimir Putin do so out of personal self-interest, others may see the writing on the wall. If Putin is going to be this self-destructive, shouldn’t we give thanks for him and leave it at that? Why bother defending seam states that Russia invades, when we can just wait for Putin to finally scare off investors and increase the mortality rate in central asia some? The first reason, of course, is that such “realism” (realism is international relations for those who don’t understand math) ignores the beneficial effects of economic growth. Those who say, let Russia do what she wants, her surviving neighbors will naturally be frightened and come to us, think that a wealth-generating free democracy is just as much of a threat to us as a wealth-recycling petrostate. The second reason is that gap states are like Russia inherently destructive. They recycle wealth from wealth producers, and use it to destablize wealth producers. For very rich countries like America, Britain, France, and Germany, this does not matter much. However, the bad behaviors of gap states like Russia can make the difference of life and death in seam states such as Ukraine and Georgia, and even new core states of the global economy like China.